In the past, making data tangible was a complicated, manual process. Digital 3D representations of complex data have been around for quite a while, but they were always conﬁned to the digital world. Mostly because it was impractical to convert a digital model to a physical representation. With the advent of cheap, affordable 3D printers, this changed. 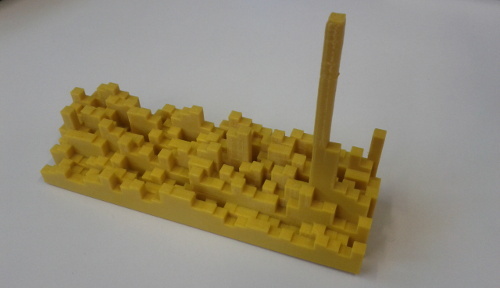 It is now easy to convert a purely digital model to a tangible, physical object. The missing piece in the process of making data tangible is the conversion of data to a digital 3D model. With my student research project thesis at HSR, I tried to solve that problem by providing an easy to use software library with "batteries included" that can convert arbitrary numeric data to 3D models. The library – named Tangible – is written in Python and provides a set of predeﬁned but customizable shapes, a few tools to preprocess data and a backend implementation for OpenSCAD, an open source programmatic CAD software. Tangible is implemented as a cross-compiler with a simple abstract syntax tree (AST), a set of predeﬁned shapes that build on top of the AST and an interface that allows the creation of different code generation backends. The library is ready to use, well tested and thoroughly documented. It has been released under an open source license and is available online at https://github.com/dbrgn/tangible. I'm very happy about any feedback. If you find bugs or want more features, open an issue or file a pull request on Github. If you have any other feedback, you can reach me as @dbrgn on twitter.